Australia has such a vibrant community of game developers! We might not have any large developers of AAA-games any longer, but we have many indie developers, doing many interesting and creative things. The fast five series of interviews is designed to highlight some of Australia's creative talent and what they're getting up to. This week we have a chat with Jennifer Scheurle, one of Australia's most well regarded educators and indie developers. Currently the design lead on a VR game that is being produced in collaboration with NASA, Scheurle is also part of the team behind Objects in Space, a spade trading game that is designed around an entire cockpit play experience. It's safe to say that Scheurle is one of our most boundary-pushing, innovative game developers, and any project that she is involved in is well worth your attention. Moshe R: What are you working on at the moment, and how's it going? Jennifer S: Frankly, I'm working on several projects at the same time. I am full time employed as a game design lead at Opaque Space, predominantly on the game Earthlight VR but also on yet unannounced new things. Earthlight is a VR game in collaboration with NASA that follows the story of a young astronaut during her training and her deployment to space missions. It's pretty surreal to collaborate with the smart people at NASA, but it is going exceptionally well with the new team and it's as exciting as it gets, really. We're working on problems that I didn't even know we had, which is only empowering me to want to be better every day. We're also working on something that allows people to experience a scenario with their own eyes that not even 600 humans in total have ever done. 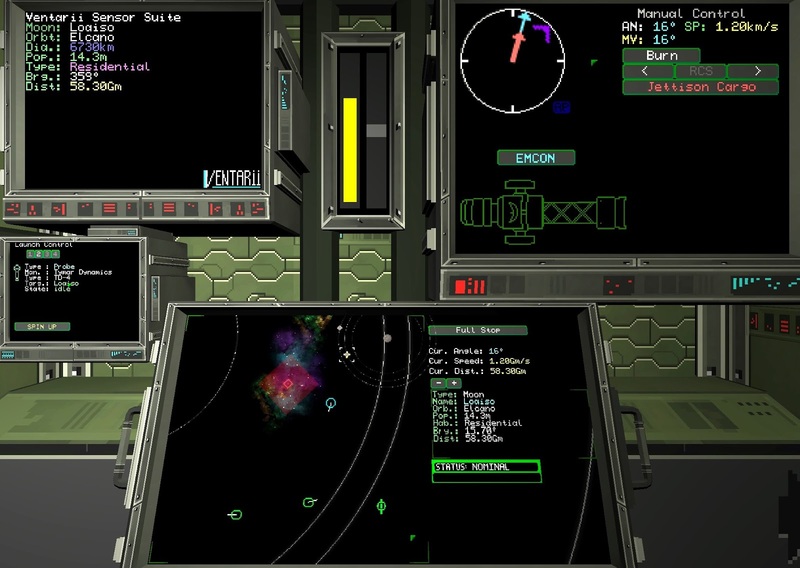 Apart from that, I'm still working with the team at Flat Earth Games on Objects in Space, a modempunk space stealth trading game that plays a lot like submarines in space. It has been one of my biggest babies in terms of work for my entire career and it very dear to me. We are closing in on release for late 2017/early 2018 now and I can't wait for people to see this massive project done by a really small team. It's remarkable to be part of this. So... you could say my work life is going pretty great, hey. Moshe R: What do you think about the state of the Australian game development industry at the moment? Jennifer S: Well, I pretty much literally left my home country for it, so there is some magic to this industry over here that may be hard to see when you're so close to it sometimes. I have rarely seen an industry be so close among each other and yet so open for outsiders. People here are wonderfully approachable, there is very little hierarchy and elitist mindset and people are always ready to share their experience and expertise, which overall makes all of us better at what we do. I wish the Australian government as well as the rest of the world would realise the value of the work that is done over here, because these people deserve so much better. Moshe R: What recent game would you recommend to people at the moment, and why? Jennifer S: This is so difficult, because I tend to be incredibly out of date when it comes to playing recent games. I have very little time, so I tend to be late to the party a whole lot with new releases. The game I'm playing the most at the moment is probably Horizon Zero Dawn, which has plenty of flaws from a game design perspective, but is so beautiful and lovable that I forgive all of them. Bless the new trend of photo modes as well, I swear. What a nice way to allow players to engage with your content in a whole new way outside of the regular gameplay! If I had to recommend a game to especially game developers, it would probably be The Beginner's Guide, which is a game that spoke to me deeply on the level of being a game developer myself. Moshe R: What's something you love about the general games industry at the moment, and what's something you wish would change? Jennifer S: Oh there is so much to love about the games industry and about my craft, I honestly don't know what else I would do. There is no other medium that allows creators to speak at such length and intimacy to their audiences! I deeply believe in the importance of a creator and consumer relationship that the games industry has yet to fully explore - and we are paving the way towards that! I always wanted to be part of that change and here I am. With every great love, there are aspects that you will probably find deeply conflicting and the games industry has plenty. The rampaging sexism that I didn't believe was real until I actually started working in the industry. The harassment and pain that is real for myself and many of my female colleagues in particular. The lack of representation for many groups out there. The many hours of overtime that we still expect of our creatives and that burns them out, unable to continue to work at their best. There is a lot of work to do, but I'm ready to take it on. Moshe R: Hatsune Miku; yes/no? Jennifer S: Yes, definitely! Funny story, I was just very recently involved in work for a yet unannounced TV project about game developer kids and one of the characters is very heavily inspired by Hatsune Miku.